Everyone needs a little "me" time, so why not make it indulgent me time. 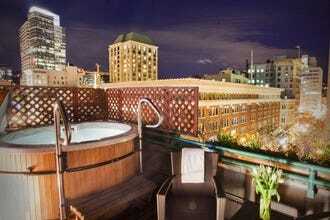 Enjoy your time in Portland, Oregon by spoiling yourself at some of the most posh luxury hotels Portland has to offer. In Portland you will find over the top amenities at all of the hotels on our 10 Best Luxury Hotels list. For example The Heathman Hotel where you can indulge in ritzy, on-premises upscale dining or pamper yourself with plush king-sized beds with your choice of mattress. Three types of mattresses are available: Tempurpedic, European Pillow-Top, or a European Featherbed. If that sounds a little too glamorous pamper yourself with a stay at a luxurious boutique hotel instead like one with in-room and balcony deluxe hot tubs. Suites like this can be found at the Hotel Vintage. If you like to be seen in the same space as celebrities while you dine on exquisite steak you will adore The Benson Hotel. 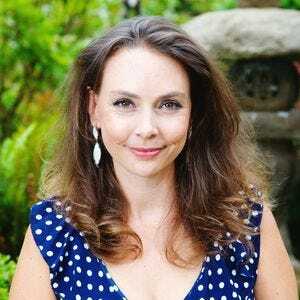 If you happen to be traveling with children they are given the royal treatment as well. Hotel Monaco provides plush robes just for kids and teddy bears during their stay. Where ever you decide to stay keep in mind that if you enjoy traveling extravagantly, Portland luxury hotels are truly the only way to stay. Dossier Hotel is a new upscale hotel in downtown Portland that pampers guests by catering to their every whim and desire, from unpacking a suitcase for you to bringing you Salt & Straw ice cream at any time of day. The hotel rooms feature Beautyrest pillowtop mattresses, a pillow menu, eco-friendly bath products from Lather, walls filled with images by Slim Aarons, and complimentary Shinola bicycles for guests to borrow. The guest room honor bars are stocked with locally made snacks, wines, craft beers and spirits distilled in the Portland. On-site Omerta an Italian restaurant and Opal an imaginative cocktail bar. 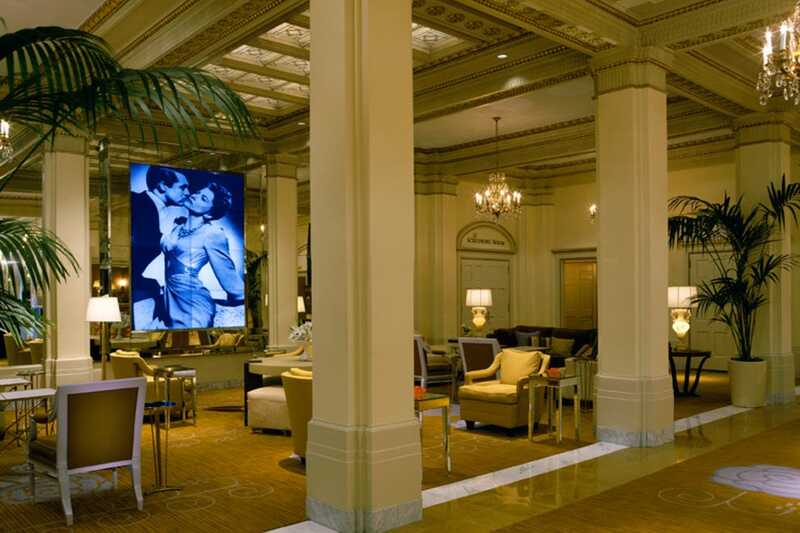 Hotel DeLuxe offers boutique accommodations dedicated to classic Hollywood. The large, comfortable rooms feature a vintage, mid-century elegance. The Hollywood motif is taken to the point where each floor is dedicated to a specific film maker. The lobby features similar mid-century, if somewhat baroque style and includes a wall of video screens displaying stills from classic movies. The Driftwood Room, a retro lounge, is designed so that one might expect to bump into the Rat Pack leaning against the bar. Private events can be held in "The Screening Room" which, while serving as a banquet hall, really is set up for screenings. 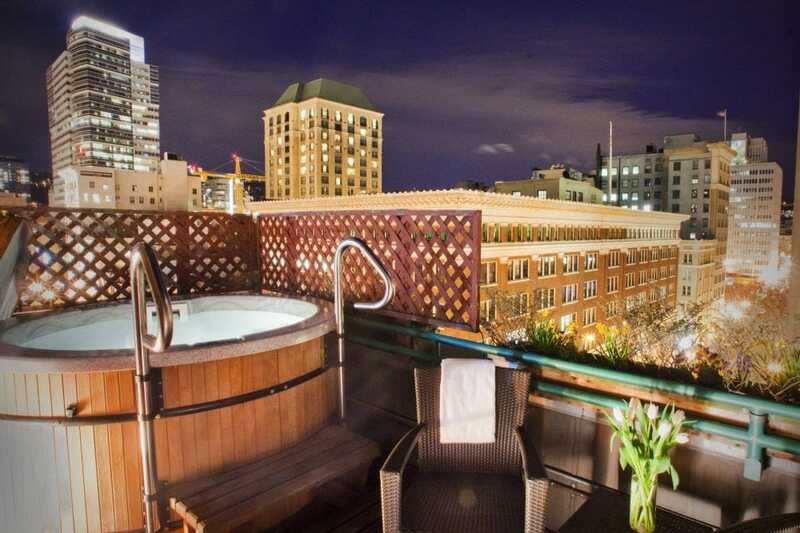 Just five blocks from both Downtown and the Pearl district, Hotel Deluxe's location is surly one of its biggest selling points. Situated on a quiet street close to everything, the hotel is adjacent to the Portland Street Car and several bus lines. In the summer, The NW Film Center holds weekly movie screenings on the roof of the hotel's parking garage located next door. The Duniway is a Hilton Hotel in downtown Portland, Oregon that opened a few months ago. This upscale hotel offers 327 rooms with a a variety of plush amenities like 500 thread count linens and wall paper created from books from local icon Powell's Books. On-site is the gorgeous Jackrabbit restaurant by Chef Chris Cosentino featuring lots of Pacific Northwest selections. If you do not want eat here you can opt for room service. There is also a 24 hour snack shop on-site. The Duniway also offers a lounge, coffee bar, meeting space for up to 180, fully equipped fitness center and heated indoor lap pool. The Porter Hotel is Portland's newest luxury hotel in downtown Portland boosting a variety of plush amenities including the hottest rooftop bar in town, Xport. In addition to their popular bar they also have Terrane Italian Kitchen + Bar restaurant and Chiosco pizza window. They also have a well appointed 24 hour fitness room that offers classes in meditation, yoga and aqua aerobics.. The luxury continues in the rooms where you will find soft Frette robes, an extensive minibar featuring local spirits, and an incredible mattress ensuring good sleep. 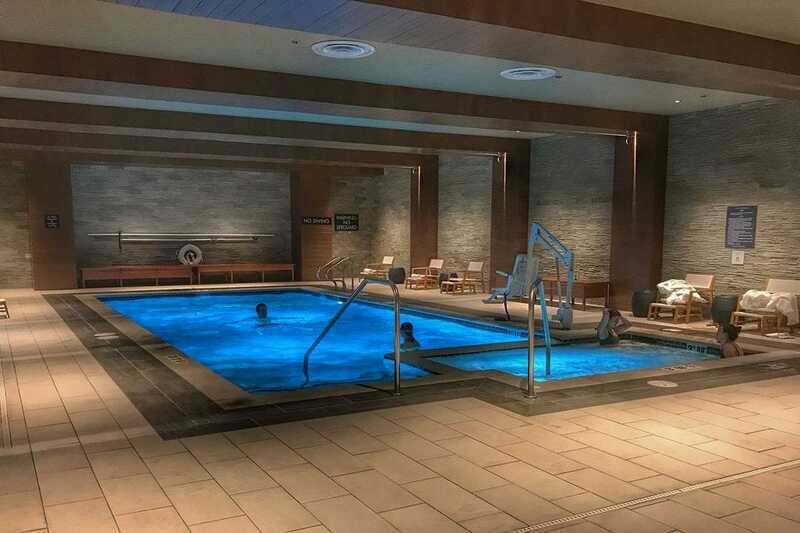 The Porter has a lovely downstairs area with a pool, hot tub, sauna, and steam room. Built in 1894, Hotel Vintage is indeed a vintage hotel. But it's interior has been completely reconstructed with fully modern updates. Now the "Vintage" refers to the wine motif used in the decor. The design is a celebration of Oregon wine country and the many vintners found there. Each room is dedicated to a local winery or vineyard and the hotel provides a nightly reception allowing guests to sample local wines while sitting by the fire in the elegant living room. The wine cellar is even available to rent for private events looking for a unique, rustic atmosphere. 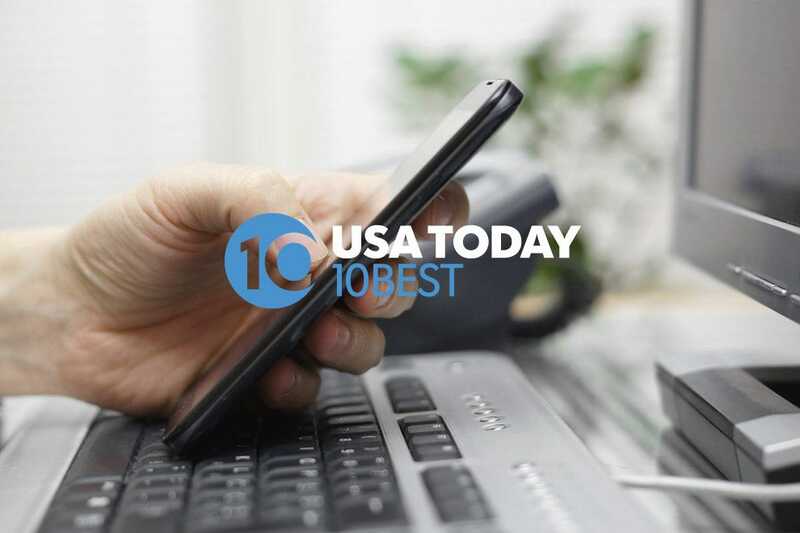 With a four-star rating, Hotel Vintage has all the amenities one would expect including 24 hour business and fitness centers and an award-winning adjacent restaurant. Located in the heart of Portland downtown, everything from Powell's books to the Portland Art Museum are an easy walk. More distant neighborhoods are quickly accessed via light rail and bus, available at the transit mall two blocks away. The Nines Hotel offers 330 guest rooms and suites in an upscale hotel with sweeping views of Portland. Nines Hotel offers luxury bath facilities with complimentary brand-name toiletries, hair dryers, robes, and slippers. Upscale amenities are also available, including flat screen cable televisions, mini-bars, premier bedding, and turn down services. Handicapped accessible rooms are available upon request. Several amenities are available at the Nines, Portland, including concierge services, valet dry-cleaning, and laundry services. The fully equipped fitness center offers massage services. Both a restaurant and a bar are available. 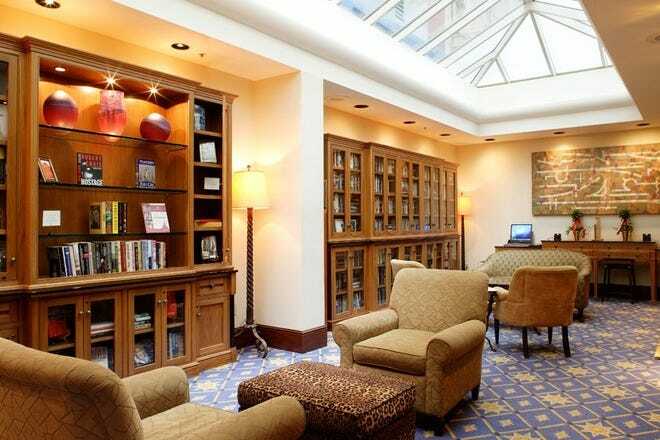 Business travelers are welcome to use the meeting spaces, business center, and high-speed Internet access. Hotel Monaco Portland is located in the heart of Portland, Oregon and many points of interest are within walking distance from the hotel. Each of the 221 rooms has a luxury bath with complimentary Aveda toiletries and a bathrobe. Yoga kits are provided, along with instructions on the cable television. 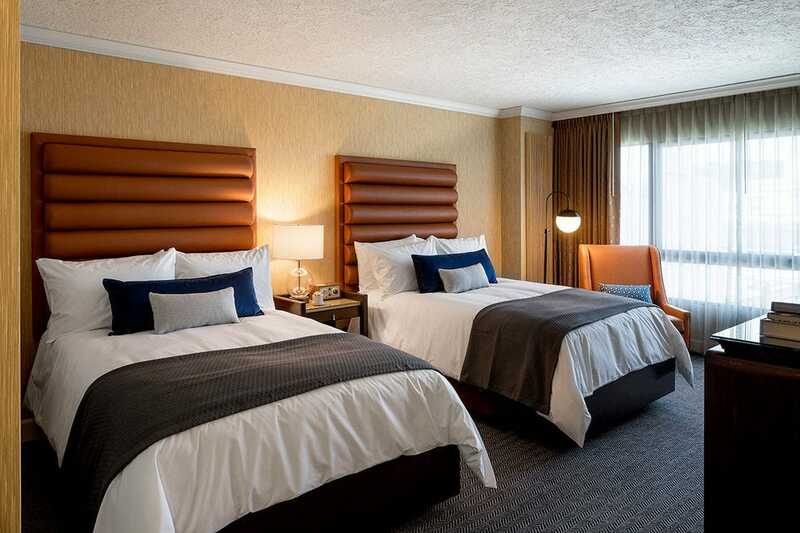 Also available are wireless Internet, desks, premium linens, and an honor bar with organic and eco-friendly products. 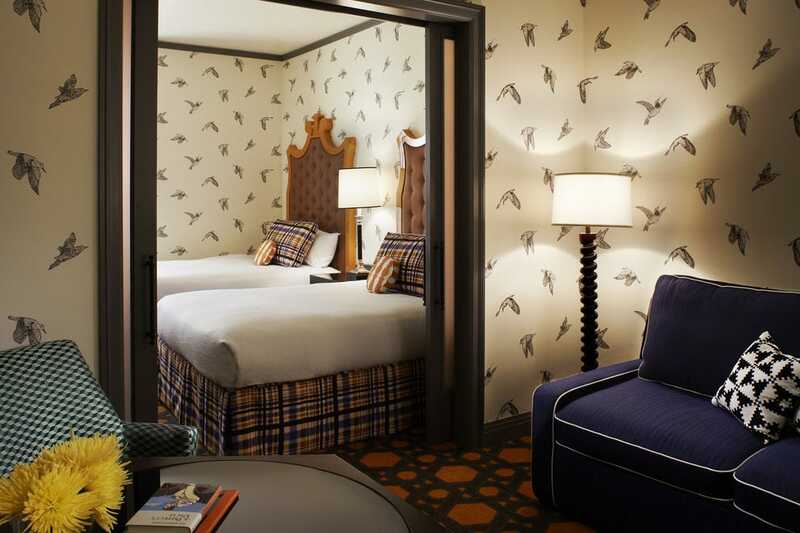 Many amenities are available at the Hotel Monaco Portland including an on-site bar and a restaurant with kid options. The well-equipped fitness center offers an Aveda day spa. A complete business center, with conference and meeting facilities and high-speed Internet connection, is available for business travelers. Complimentary coffee is served each morning, and a wine hour is held every evening with free beer and wine. They even have a kids program. They also will provide you with a child safety kit with outlet covers, toilet latches, and night-lights. The Benson Hotel was one of the first hotels in Portland. It was built in 1912 and has been in operation since the following year. It is centrally located in Portland's downtown area which offers easy access to shops, restaurants and galleries. In addition, attractions such as the Portland Art Museum, the Oregon Zoo, and Mount Hood are all within reach. Located 20 minutes from the Portland International Airport, limousine and Town Car service can be arranged by either the concierge or the front desk staff at the Benson Hotel. Valet parking is available. 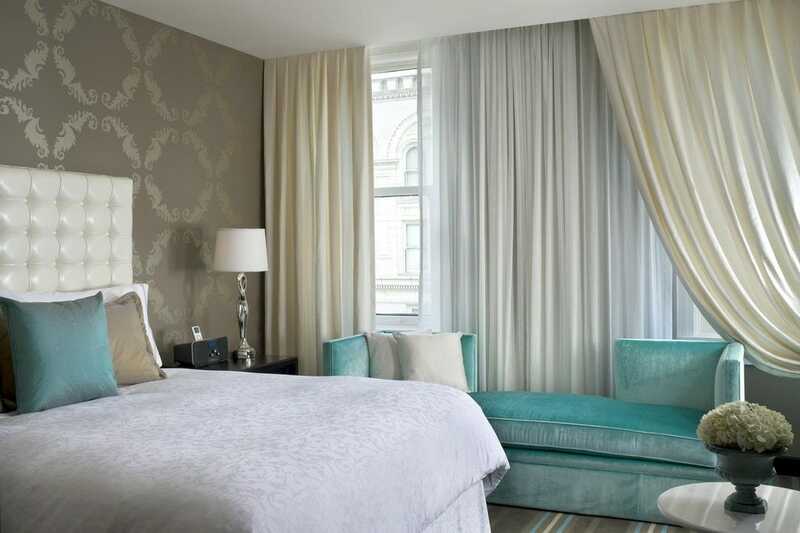 The Benson Hotel's rooms range from standard guestrooms to penthouses and presidential suites. Standard amenities include mini-bars, irons and ironing boards, hairdryers, over-sized desks with a comfortable desk chair and wireless high-speed internet. All rooms are non-smoking. The Benson Hotel is on the National Registry of Historic Places. Hotel amenities include fresh fruit at check-in, wine tasting in the cellar, complimentary fresh coffee and newspapers in the lobby, afternoon tea and cookies in the lobby, a business center, and health club. The Heathman Hotel has to be the most romantic hotel in Portland, because not only is it a wonderful luxury hotel but it is the setting for much of the 50 Shades of Grey book series. 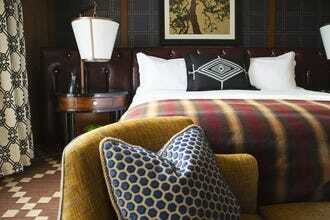 The Heathman is a 5 star hotel in downtown Portland with 150 guest rooms and suites. They are known for their excessive amenities. All units come equipped with LCD televisions, high-speed Internet connections, safe-deposit boxes, ironing equipment, mini bars, coffee/tea makers and telephones with free local calls. Private bathrooms come with hair dryers and complimentary toiletries, among others. The Heathman Hotel is a 10-storey property that was built in 1927. This boutique-hotel provides a business center, meeting/banquet facilities, concierge services, airport transportation, a 24-hour front desk and catering services. 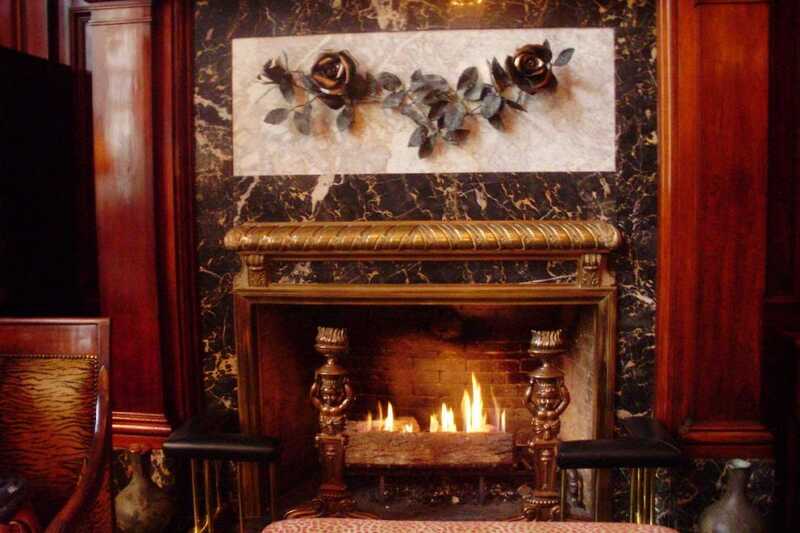 Guests can wine and dine at the hotel's Heathman Restaurant and Bar. Located on the banks of the Willamette River, Riverplace Hotel is one of Portland's most picturesque inns. The decor, heavy on wood, stone and earth tones, is decidedly Oregonian. The adjacent Riverplace Marina means that you can bring your boat. Many of the rooms feature panoramic views of the river and downtown. Located at the south end of Portland's Waterfront Park, the Riverplace has super easy pedestrian access to Portland's downtown greenway. The Main Stage of the Portland Blues festival, held the first weekend of July, is almost directly next to the hotel. Walk one mile north along the waterfront's continued park and one can find Portland's Saturday Market, open every weekend March through December. Riverplace features an on-site restaurant, Three Degrees Waterfront Bar and Grill. Its award-winning kitchen provides room service for hotel guests who would rather not go out at all.